LIGHTHOUSE has created an assortment of different EURO-Albums which will allow you to begin to collect the various coins from the European Community in either whole sets or single coins. The components within the albums, such as the foils and coin sheets,are fabricated without the use of chemicalsofteners and acids which will ensure a long-term protection against environmental influences.The Lighthouse Euro coin album is manufactured as a stunning hand-stitched binderwith a leatherette cover with bold imprints on the spine and cover. There are six Euro-coin extra heavy sheets with clear view pockets and sliding inserts in hard PVC. 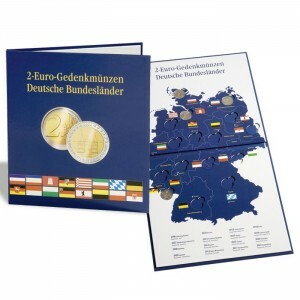 The albums provide a beautiful presentation for coins from all twelve countries of the European Union. The company also offers a wide variety of accessories for EURO coins. In addition to coin albums, they provide coin sheets, coin boxes, and albums for banknotes, coin capsules, and presentation cases, and all are designed to perfectly fit each Euro coin and guarantee the best possible protection for your collection. 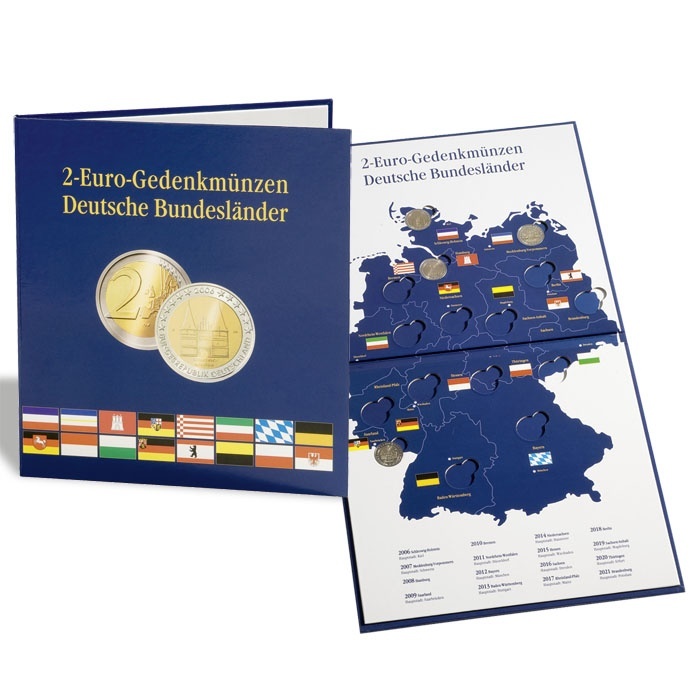 LIGHTHOUSE Euro Collection Coin Folder is a two-page 8.5” x 11” folder that opens to 17” x 11”, and allows you to collect and store Euro denomination coins from all twelve countries of the European Community. This folder will hold coins from Austria, Belgium, Finland, France, Germany, Greece, Ireland, Italy, Luxembourg, Netherlands, Portugal and Spain, and will allow a presentation of 2 Euro, 1 Euro, 50 Cent, 20 Cent, 10 Cent, 5 Cent, 2 Cent and 1 Cent from each country. LITTLETON has also created a Euro Type Coin Album to creatively display and organize your international coin collection. Each album is designed with labeled spaces to hold the 1, 2, 5, 10, 20, and 50 Euro Cents, plus 1 and 2 Euros for each of the original participating nations in the European Community. It is a very handsome album in an attractive deep green with gold-embossed lettering in a durable 3-ring binder. It is produced with archival-safe materials and features clear protective slides that provide an easy and convenient view of each side of your coin. Some of the album selections are the 1990-Date Australian Silver Kookaburra Album, a World Currency Album, the 1988-Date Canadian Maple Leaf Album, as well as a World Gold Coin Presentation Case. LIGHTHOUSE Coin Capsules are made from extra durable, scratch-resistant acrylic which offers a crystal clear view of each coin in your collection, while providing the maximum amount of long-term protection. They are made to fit a wide range of most of the common U.S. and International coins. They are very easy and convenient to open while offering a secure and ‘locked’ storage compartment for your coin. These great coin capsules can be stored in Lighthouse coin boxes for an elegant and sophisticated display of your collection. The boxes are designed to stack as a unit or store in lockable coin box cases. They come with smoke-colored trays with dark red inserts that create an impressive appearance for your collection, while being completely interchangeable, expandable, and stackable. They are created with an interlocking design that allows the boxes to be stacked securely, or stored in any Lighthouse aluminum carrying case. Air-Tite Coin Holders come in two types or styles for your international coins, Air-Tite Holders with Rings or the Air-Tite Direct Fit capsule. The Air-Tite coin holder is a two-piece snap- together acrylic case comprised of a cover and a base to fully encase a single coin. Air-Tite Holders with Rings are capsules that include a soft die-cut polyethylene ring to fit around the coin. The ring serves to secure the coin in place, creating a perfect barrier against all types of environmental contamination. The rings can be purchased as part of a capsule set in either black or white, and are available in sizes ranging from 10mm to 50.8mm.Air-Tite Direct Fit capsules are formed to contain a specific mint condition coin. The coin will fit tightly into the holder without requiring a supplemental sizing ring. Direct Fit capsules are manufactured exclusively for the most popular coins. The following international coin-sizing chart will provide a quick reference to locate some of the various coin sizes and coin denominations for coins from all over the world, along with both the Air-Tite and Lighthouse coin capsules’ corresponding model numbers.